If you love cycling, then you need a dedicated bike speedometer. Bike speedometers need to be reliable giving you accurate information on speed and cadence records. While some users prefer a simple speedometer, the options on the market are overwhelmingly posing a challenge for new customers. This review will look to solve that problem by looking at some of the best bike speedometers on the market. Read through and choose a device that best suits your cycling needs. Bomeon is a multifunction LCD solar power bicycle speedometer that can give you all the stats you need ranging from the total distance, max speed, average speed, trip distance, clock and speed tendency. The unique combination of battery and solar ensures the speedometer is always powered. This is one of the easiest speedometers to operate. You can easily attach it to the mounting bracket and push it down to remove it. The extra-large display allows you to read the stats with easy. 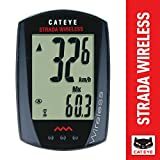 CatEye gives stats that include your current speed, average speed, max speed, two trip distances, total distance, pace arrow, elapsed time and clock. You can manually set the odometer when changing the battery so that you don’t lose miles. Users can also customize the speedometer so that they get their preferred data stats. The fact that this speedometer knows when you’ve stopped and started the journey makes it a good fit. 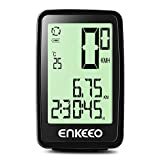 Enkeeo is another durable pick for a bike speedometer with the capability of keeping the LED light on for 12 hours. This enables the rider to check stats at any time of the day or night. Operation of the speedometer is quite simple. Charging is done with a USB cable, and there is no need to change batteries. The design of the unit is minimalistic with a two-button operation and a three-line for improved readability. Overall, this is a good speedometer with precise measurements and data storage for up to one week. 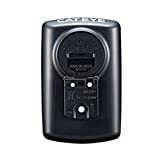 This is another excellent unit from CatEye giving you all the statistics you need when riding. The speedometer gives you the current speed, average speed, maximum speed, trip distance, total distance, clock and the elapsed time. Users can save the miles when changing the battery by manually setting the odometer. Toggling the unit function is done by pressing the unit. This ensures you concentrate on your riding. This unit comes with a secure flextight bracket so that you can easily mount it without any problems. 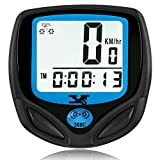 The Bike Computer Speedometer is a multifunctional unit with the ability to give you average speed, current speed, and maximum speed both in miles and kilometers. It also reads the current temperature, distance, maintenance alert and scan. The design of the unit is user-friendly with backlight to enable you to read at night. It is a waterproof unit enabling users to use it on a rainy day. The connection is wired keeping the connection stable and the battery long lasting. This is a versatile speedometer with a large LCD and a good option to check out this year. SY Bicycle Speedometer is among the best-sellers in bike speedometers with an auto wake-up function that detects bike vibration. It is one of the easiest speedometers to operate with a large LCD so that you can read stats with ease. It is a versatile choice that can be used in various situations. The unit is small, compact, lightweight, waterproof and wireless. The green and white light ensure you read both during the day and night without straining. Installation of the unit is pretty easy and takes a few minutes. The Wireless Speedometer by SOONGO offers users a wireless transmission with a powerful anti-interference chip. This is an advanced bike speedometer that offers users a wide range of stats any time of the day. Easier operation through touch mode ensures users have no trouble operating the unit. This unit is a great pick and does not lose its data even after power is off. The LCD screen is large with both the green and white light for easy reading of the stats. It is also waterproof and can be used on a rainy day. This is another favorite CatEye speedometer that gives users all the stats they need. It automatically starts and stops so that you will not sweat any red light. The computer will automatically detect when you’ve stopped and started the bike. The navigating menu can easily be toggled by pressing at the base so that you can only focus on your ride. This unit comes with a flextight bracket that easily secures the unit and lets you ride peacefully. 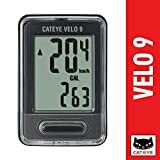 CatEyeVelo is a leading bike speedometer with the ability to give you all your favorite statistics. The unit displays your current speed, maximum and average. It also gives you the trip distance, total distance, speed, carbon offset, calories, pace arrow, elapsed time and clock. This is one of the few units that tracks carbon offset and calories. It comes with a wired sensor to give you accurate readings. The battery of the unit lasts for three years so just install and forget about installation. 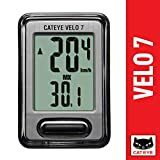 CatEyeVelo 7 is the leading bike speedometer on the market currently with good reviews and recommendations online. The unit lets you go the distance with a battery lasting three years. This Velo comes with a wired sensor for precise readings. It automatically detects stops on red light so that you don’t sweat on stopping it. This is a perfect choice for beginner cyclists and a high-quality pick overall. Make bike riding more enjoyable with this bike units today. These are the best picks on the market to offer you good value for your money. You can order with confidence and have it delivered to your home address.